Three-quarters of Internet users have looked for information on their hobbies or interests. 77% of Internet users have searched for hobby or interest information online as of January 2002. That represents growth of 40% from 65 million who had pursued hobby information online as of March 2000, to 91 million who had done so by January 2002. Online men are more likely to have done this than online women. A lower proportion of online African-Americans have looked for hobby information online than whites or English-speaking Hispanics. Young adult users are more likely than older Internet users to have sought hobby information. A higher proportion of home broadband users have sought hobby information online than dial-up users. Approximately three-quarters of those who are online have sought hobby information on the Web at one time or another. Hobby searching has been a popular activity in the online world since we started measuring it in March 2000, and its prevalence shows no signs of waning. However, while the sheer number of people who have sought hobby information swelled (from 65 million to 91 million Americans) as Internet penetration increased between 2000 and 2002, the proportion of Internet users who are hobby-seekers has generally stood between 75% and 80% of the entire Internet population. Similarly, the number of users researching their hobbies on a typical day has increased (from 15 million to 22 million people), but the share of the Internet population that does so has generally been about 19%. Throughout all of our surveys, men have been more enthusiastic hobby pursuers than women. When we last asked about this activity in January 2002, 81% of men had pursued their hobby online, compared to 73% of women. A slightly more prominent gap exists for those who look for hobby information on a typical day (24% of men vs. 14% of women). Likewise, we reported in May 2002 that twice as many men as women claimed the Internet played an important role when they decided to begin a new hobby. Combing the vast amount of hobby information available online is popular both among new users and veterans. Education and income generally have a mild effect on how likely people are to visit Web sites that relate to their hobby. Two-thirds of users have gone online just for fun. 65% of Internet users said they have gone online to browse just for fun as of January 2002. That represents growth of 44% from 54 million Internet users who say they had browsed the Internet just for fun as of March 2000, to 78 million who had done so as of January 2002. Online blacks and Hispanics are more likely than online whites to have browsed the Internet just for fun. Young adult Internet users are more likely to have surfed for fun than older users. Those online Americans with lower levels of education (high school diplomas) and with moderate incomes are more likely to have gone online for fun than those in higher education and income brackets. A greater proportion of newcomers than Internet veterans have wiled away hours online just for fun. Those with broadband access are more likely than dial-up users to have browsed the Internet for fun. Seventy-eight million Internet users say they sometimes go online for no particular reason, just for fun or to pass the time. That is 65% of the Internet population who have online sessions intended for personal recreation and represents an increase of 24 million people between March 2000 and January 2002. Twenty-two percent of online Americans (26 million people) went online just for fun on a typical day in January 2002, up from 21% (18 million) in March. Going online for fun can encompass many different types of activities. For example, many of the Internet users who say they surf for fun might end up looking for hobby information, hopping from link to link from sites that have captured their interest, downloading music or playing a game during these recreational sessions. Men have been marginally more likely than women to go online for fun, particularly in recent survey periods. Prior to that, a steady pattern of differentiation was not apparent. In January 2002, 67% of online men said they had gone online for amusement, and 63% of online women said so. 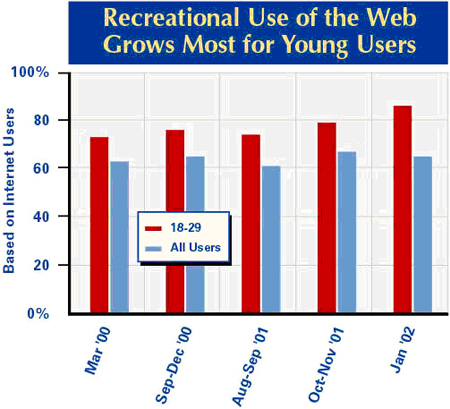 Not surprisingly, 18- to 29-year-olds are the heaviest recreational users of the Internet. In January, 86% of these young adults said they would sometimes go online just for fun, compared to just 60% of 30- to 49-year-olds. This undoubtedly reflects the large amount of time this age group spends on leisure activities both on and offline. Of course, this group also includes college students, who we have previously reported are very heavy users of instant messaging, music downloading, gaming and other leisure activities.65 At the other end of the age spectrum, seniors report varying levels of recreational web surfing compared to other age groups. A trend that is likely influenced by age, those with lower income and education levels report the highest incidence of using the Web for the purposes of entertainment. In January 2002, 70% of users with a high school education said they had gone online just for fun, compared to 56% of online college graduates. And while 75% of users living in households earning less than $30,000 per year had recreational web sessions, 58% of those living in households of $75,000 or more had them. Those with high-speed connections at home are more likely than others to do this activity. In a special callback survey conducted in February 2002 for “The Broadband Difference” report, we found that 71% of broadband users had gone online for fun, while 64% of all Internet users (going online with any type of connection) had done so. About a third of users download music files. 32% of Internet users have downloaded music, as of October 2002. That represents growth of 71% from 21 million Americans who had downloaded music as of the summer of 2000, to 36 million who had done so as of October 2002. The number of users who download on a typical day doubled from 3 million to 6 million between 2000 and 2002. 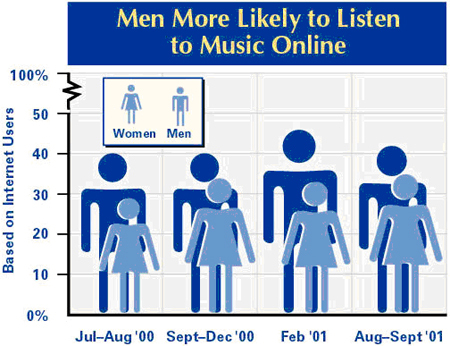 Online men are more likely than women to download music. This activity is particularly appealing to online minorities. Young adults and teens are the likely downloaders. There is a higher proportion of downloaders among those with modest household incomes and with high school diplomas. Those with broadband connections are more likely than others to download music. With the rise and fall of Napster and the subsequent popularity of other file-sharing software programs such as KaZaA and Morpheus, downloading music — the act of copying audio files available on the Internet to the hard drive on one’s personal computer — has grown markedly since 2000. In the summer of 2000, there were roughly 21 million American adults who had downloaded music online, which represented less than a quarter of the entire Internet population. But by October 2002, about 36 million American adults, or 32% of those with Internet access, had pulled music files off the Web. On an average day in October, 5% of online Americans (6 million people) were downloading music, up from the 3% (3 million) that reported doing so in the summer of 2000. There has been much controversy over the morality and legality of downloading music in recent years. The recording industry has blamed music downloading for an estimated $5 billion in losses worldwide in 2002 alone.68 Yet, it is important to note that our question phrasing does not attempt to differentiate between the types of music files — copyrighted or not, with or without permission — that Internet users are downloading. From the average Internet user’s perspective, it is sometimes difficult to distinguish what types of files are legally distributable; while much of the content that is exchanged is copyrighted and not meant for widespread distribution, some popular artists have released free MP3 versions of their songs for promotional purposes and some new artists have circulated their music freely over the Web to build up a fan base. Male Internet users have consistently had the greater appetite for downloading music compared to women. That gap had narrowed slightly by the time we polled this activity in October 2002, but men still held a steady lead; 35% of male Internet users said they had downloaded music, compared to 29% of female Internet users who said so. 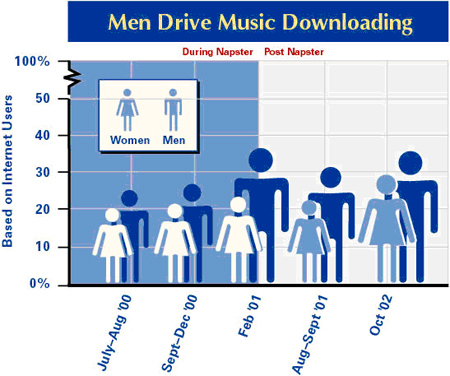 Men had also downloaded with greater frequency than women during this period; 7% of male users were downloading music on a typical day in October, while only 3% of female users reported doing so. Wired young adults have undoubtedly driven the growth of music downloading more than any other adult age group. As we have reported previously, college students, represented in the 18- to 29-year-old demographic, are twice as likely to have downloaded music compared to the general population and they are three times as likely to do so on any given day.71 College students often have free access to high-speed Internet connections on campus and have utilized those resources to become pioneers and heavy users of file-sharing technologies. 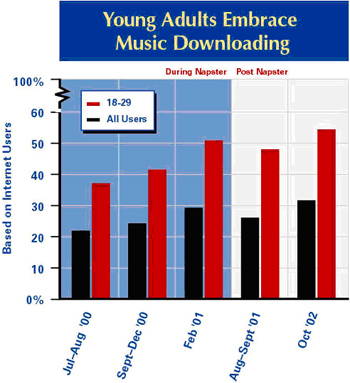 The older an Internet user, the less likely he or she is to have downloaded music. While 54% of 18- to 29-year-olds had downloaded music in October 2002, just 29% of 30- to 49-year-olds had done so. Children and teens have been even more voracious downloaders. In a special survey of 754 children between the ages of 12 and 17 that we conducted in late 2000, we found that 53% of online children had downloaded music. For comparison’s sake, only 42% of 18- to 29-year-olds said they had done this. Considering the growth that has occurred across all age groups between 2000 and 2002, it is likely that number of children downloading music has also grown. A trend that could be related to the high proportions of young adults who download music, Internet users with lower education and income levels are more likely music downloaders compared to those with higher levels of education and income. In our October survey, 39% of users with a high school education or less had downloaded music files, compared to just 25% of those with a college degree. The effect of income is somewhat less pronounced; 38% of users who had household incomes of less than $30,000 had downloaded music, while 30% of those with household incomes of $75,000 or more said they had done so. In 2000, 2001, and 2002, downloading music was one of the few activities for which experience did not play a key role; it was more or less an equally popular pastime among new users and seasoned veteran users alike. However, in part because of the large amount of bandwidth required for the speedy transfer of large music files, those with high-speed Internet connections are far more likely to have downloaded music than other Internet users. In October, 51% of broadband users had pulled music files off the Web, while only 28% of dial-up users had done so. Even more striking is what occurs on a typical day online: High-speed users were more than four times as likely to download music on an average day compared to dial-up users. Slightly more users have listened to music online. 38% of Internet users said they had listened to music online in our August–September 2001 survey. That represents growth of 30% from 33 million who had listened to music online as of the summer of 2000, to 43 million had done so as of August–September 2001. Online men are more likely than online women to say they have listened to music on the Internet. 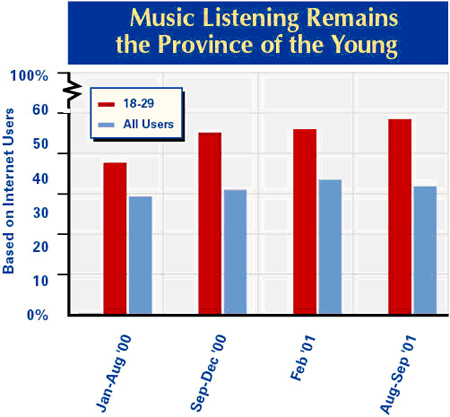 Music listening is most popular among young adult users and minority groups. A relatively high proportion of Internet users in lower income groups and those with lesser educational attainment have listened to music online. There is a higher incidence of online music listening among those with broadband connections. We first began asking about listening to music online in the summer of 2000. At that time, 35% of all Internet users, or roughly 33 million online Americans, said they had listened to music via the Web. A little over a year later, in August–September 2001, a slightly higher percentage, 38% or about 43 million Americans, said they had listened to songs online. The likelihood that an Internet user would listen to music during a typical day online did not change notably between 2000 and 2001; on an average day in August–September 2001, 4% of Internet users were logging on to listen to music. However, considering that audio quality and consistency is largely contingent on Internet connection speed, one might assume that this activity has become more widespread since 2001, as broadband usage levels have risen significantly during that time. Internet users listen to music online in many different ways. From live Internet radio broadcasts, music store Web sites and other music services, to streaming audio clips available through musicians’ or fans’ Web sites, there are a myriad of outlets from which one can enjoy music content online. The broadcasts of Web radio stations have become integral aspects of many users’ everyday experience online, especially those who value access to a diverse array of music genres and formats not typically available through mainstream radio outlets. Male Internet users are more likely to have consumed music content on the Web compared to female users. Similar to what we have found with downloading music, men have repeatedly been the most experienced music listeners. The last time we polled this question in 2001, 42% of online men had listened to music online, while only 35% of online women had done so. Just as age makes a difference in the likelihood that an Internet user will use the Web as a music resource, there is also variation according to education level; high school graduates and those with some college education who use the Internet are more likely to be online music listeners compared to those who have completed their college education. In August–September 2001, 40% of high school graduates who were online, and 43% of those with some college education said they had listened to music on the Internet, while 34% of college graduates said this. Income levels also tend to relate to age, but have a somewhat more moderate effect on music listening. Overall, more Internet users with annual household incomes under $30,000 have said they are music listeners compared to those with higher incomes. Also, Internet users with high-speed connections at home have been more likely to listen to music online than dial-up users. As we reported in “The Broadband Difference,” a callback survey from February 2002 (not a regular tracking survey) revealed that 58% of home broadband users had listened to music via the Web, while just 37% of all Internet users (going online with any type of connection) had done so. The use of the Internet to check sports scores or information has increased significantly, particularly among young people. 44% of Internet users have checked for sports scores or information online, as of September 2002. This represents 73% growth from 30 million Americans in March 2000, to 52 million in September 2002. The number of users who check sports scores on a typical day doubled from 7 million Americans to 14 million between 2000 and 2002. Online men are more likely than online women to say they have sought sports information on the Internet. Young adult Internet users are more likely than older users to seek sports information. 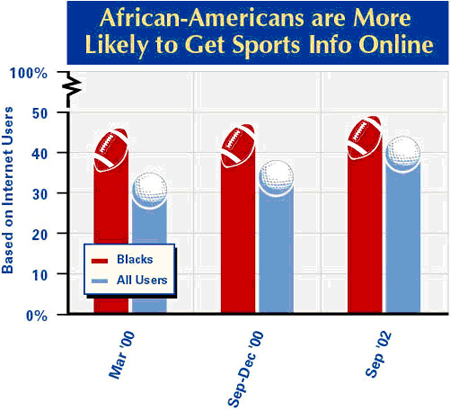 Minority Internet users are more likely to have sought sports information online than whites. Relatively low proportions of Internet users in the lowest income groups have checked sports information online. There is a higher incidence of seeking sports content among those with broadband connections and high levels of experience online. In our September 2002 survey, 44% of all online Americans said they had used the Internet to check for sports scores and information. That is a jump up from the 35% of Internet users who said they had gone online to look for sports scores or information in our March 2000 survey and represents an increase of roughly 22 million people. In the March survey, 8% of users (7 million people) were checking for sports information on a typical day, and by September 2002 that number had gone up to 12% of all users (14 million people. With content-rich sites that offer up-to-the-minute coverage like ESPN.com and the plethora of sites that cater to fantasy football leagues, the online sports audience has plenty of resources. The Web offers access to a wide array of sports news, analysis, and multimedia clips — on everything from NBA basketball to rough-terrain unicycling. Overall, men take a much greater interest in following sports online — online men are consistently twice as likely to say they have checked for sports scores and information on the Web and three times as likely to do so on a typical day compared to online women. Online African-Americans and online English-speaking Hispanics are proportionately more likely to say they have sought sports content on the Internet than online whites. We have repeatedly found that these demographics matter in terms of overall experience with this activity — however, it is not clear that online whites are any less likely to search for sports information on a typical day. The youngest Internet users are the most likely age cohorts to seek out sports information online. In September 2002, the breakdown looked like this: 51% of wired 18- to 29-year-olds reported checking for sports information, 45% of the 30-49 age bracket, 32% of 50- to 64-year-olds, and 38% of those aged 65 and over. Variations according to income have not been substantial, but users in the various income groups have shifted their tendency towards this activity over time; those in the highest income groups have become more likely members of the online sports audience. Most recently, 40% of users with household incomes under $30,000 said they had logged on for sports information, compared to 51% of those who live in households earning $75,000 or more. The number of years an Internet user has been online does appear to make a difference with sports searching once a user reaches the 4-year mark. In September, all users with less than 4 years’ experience online were equally as likely to say they had checked for sports scores and information. Specifically, 35% of those with 1 year of experience online had sought sports info, which compared to 37% of those who had been online 2-3 years and 47% of those who had been online for 4 years or more. Though the difference has not been extreme, in general, more users with home broadband access have sought sports information online compared to their dial-up counterparts. In September 2002, for example, 51% of home broadband users had looked for sports information and 44% of dial-up users had done so. Online gaming has grown modestly but steadily. 37% of Internet users said they have played games online as of September 2002. That represents 45% growth from 29 million Americans in March 2000, to 42 million in June–July 2002. Online men are more likely than online women to have played games online. 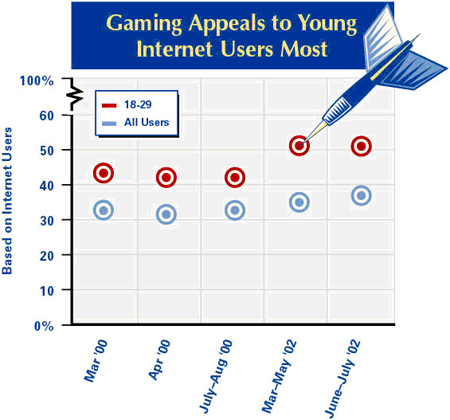 Online gaming is most popular among young adult users and minority groups. Relatively low proportions of Internet users in the lowest income groups and those with the least educational attainment have tried online gaming. There is a higher incidence of online gaming among those with broadband connections and high levels of experience online. Online gaming has grown modestly but steadily over the course of our research. Approximately 29 million Americans (34% of Internet users) said they had logged on to play games when we first started asking this activity in March 2000. By the June-July 2002 survey period, that number had grown to roughly 42 million Americans (37% of Internet users). The frequency with which users play online games has also been quite stable; between 6% and 7% of Internet users have been enjoying this pastime on any given day since 2000. In contrast to the common perception that gaming is a male-dominated activity, we repeatedly found over the course of 2000 that female Internet users were more likely to say they had played games online. In keeping with this trend, they were also more likely to participate in games on any given day in 2000. However, in 2002, male Internet users caught up with women, making online gaming equally popular for both groups. Overall, African-American Internet users have been more likely to play online games compared to English-speaking Hispanics and whites. 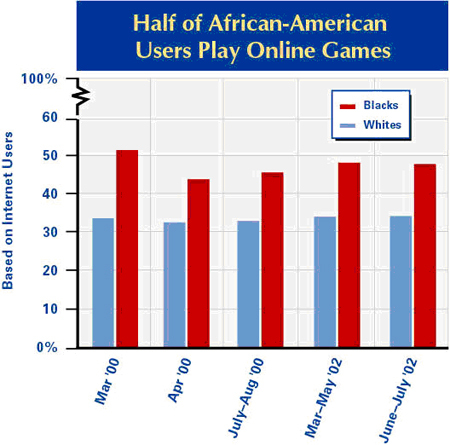 Yet, while about half of all online blacks have consistently said they have played games online since we first started asking about gaming, online Hispanics grew from 39% in the March-May 2002 survey to 54% in June-July 2002, while blacks remained at 48%.75 Whites, however, have never surpassed 34%, making them the least likely group to engage in these online competitions. One might expect to find that the youngest group of Internet users is the most savvy with gaming on the Net and is the fastest-growing age demographic for this activity. However, as we have found in our prior research, online gaming is surprisingly popular among wired seniors. In fact, 18- to 29-year-olds are the only group of users whose enthusiasm for games surpasses that of seniors. Although seniors are far less experienced with online games compared to 18- to 29-year-olds between 2000 and 2002, gaming grew more rapidly among wired seniors’ than it did for young adult users. Not unlike other “fun” pastimes on the Web that have a particular appeal to youth (such as chat and IM), those with lower household incomes and education levels are more likely to have played games online. Further, those with at least 1 year of Internet experience and users who have high-speed connections at home have been somewhat more likely to participate in online gaming. About a fifth of users create content for the Internet, and most of them have high-speed connections. 19% of Internet users said they had created content for the Internet as of October 2002. We have only asked about this activity for a short period, thus we have not found any growth in the absolute number of people who say they have created content for the Internet. More in upper education and income groups have created content than those in lower socio-economic groups. Those with high-speed Internet connections at home and those with more experience online are more likely to be content creators. Approximately 21 million Internet users say they have created content for the Internet, such as helping to build a Web site, creating an online diary, or posting their thoughts on an online bulletin board or other online community. We began collecting data for this activity at the beginning of January 2002, at which time 20% of online Americans said they had created content for the Web. The popularity of this activity is highly contingent on having access to high-speed Internet connections at home. The last time we polled this question, 34% of broadband users said they had created content for the Web and 11% said they had done so the day before. In comparison, only 4% of all Internet users were creating content for the Internet on a typical day. Because this is such a broadly defined activity, our sample of content creators could include everyone from veteran users with sophisticated graphic design skills to new users who simply post recipes to culinary Web sites. That said, it is still overwhelmingly an activity that appeals to more experienced Internet users. In October 2002, 28% of users with 6 or more years of experience online had created content for the Web, while just 17% of those who had 4-5 years’ experience online had done so. Overall, men have outpaced women for this activity, possibly reflecting the greater number of men who have broadband access at home. In October, that meant that 24% of online men and 15% of online women had produced Web content. As is the case with other activities that favor high-speed Internet connections, such as music downloading and playing online games, creating content is widespread among younger Internet users, who tend to have access to faster connections. 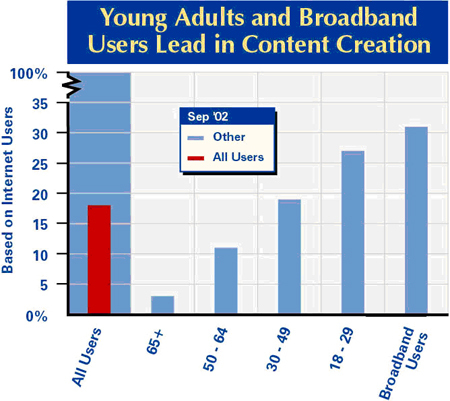 Seniors, who are the least likely of all the demographic groups to have broadband access, understandably lag far behind in experience with content creation. Internet users with higher education levels are generally more likely to contribute content compared to those with less education. Variations according to income have been less consistent, but by October 2002, users with household incomes of $50,000 or more stood out as more likely content creators compared to those living with smaller incomes.